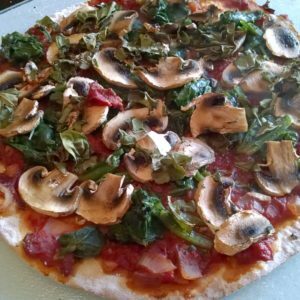 Mushroom-spinach pizza with onions and fresh tomato sauce. I have a friend who is married to an Italian. New York Italian. So Italian they ate spaghetti together as a family every Wednesday night when the family was all geographically close. I tried to disagree with her, but my no-Italian background couldn’t compete with her married-to-an-Italian connection (even though her husband is only half Italian). Instead, I set out to prove her wrong by making cheese-less pizzas that are so good it doesn’t matter what you call them. ured counter to form a soft ball then place in a lightly oiled bowl, cover it with a wet cloth or plastic wrap, and place in a warm place to rise until doubled, about 1 hour. When the dough is ready, divide it in half and form the crust for the first pizza. Of course you can also buy a pre-made dough. For a whole-food, plant-based diet, the trick is finding one that’s low in sodium and fat. Fortunately there are a few options, including the Engine 2 crusts found at stores like Whole Foods. 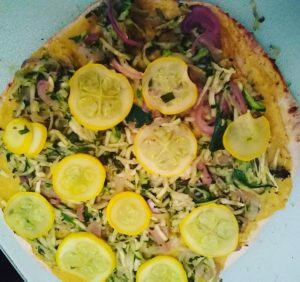 Squashed pizza with Delicata squash sauce, topped with fresh basil, red onion and shredded zucchini, and sliced yellow squash. The next step is the sauce. You can use a canned pizza sauce (again being mindful of fat and sodium) or you can make your own. We usually make our own because we like to go beyond tomato sauce. An easy recipe is to mix 2 tablespoons each of dried oregano and basil and 2 teaspoons of minced garlic into a 15 oz can crushed tomatoes and use it for a sauce. But an even easier option, is to use a canned tomato sauce. The final step is the toppings. What you put on next is important. Cheese can cover up a lot of bad or bland flavors. When you omit the cheese, the flavors underneath must ben the best you can put together. That is, when you put cheese on them, you can get away with poor quality vegetables. Otherwise, high quality is a must. Keep it simple and sprinkle some fresh herbs like basil over fresh vegetables, such as mushrooms, tomatoes, fresh bell peppers or sliced onion. 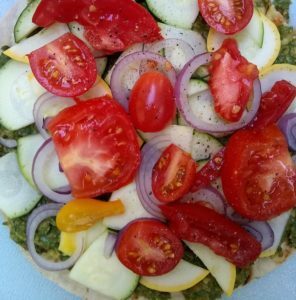 Pesto pizza made with plant-based (no oil) pesto, and topped with garden-fresh summer squash, zucchini, tomatoes and red onion. Or make a south of the border pizza using enchilada sauce, cooked or canned black beans, bell pepper, avocado, and chopped cilantro. Or make a Hawaiian pizza with pineapple chunks, tofu bacon, red onion and red pepper. But keep in mind that unlike a cheese pizza, you won’t get as many calories. If you aren’t topping it with beans, it will also be lower in protein. So even if you eat a whole pizza pie yourself, you may want to supplement your meal with a hearty salad that includes some lentils or other legumes in the mix. *To be fair, dictionary definitions of pizza all include cheese in the description. In addition, the history of pizza includes cheese. So yes technically, if it’s cheese-less is not pizza, but it’s still good.